At the start of this season, there were 76 Venezuelan players on MLB’s 25-man rosters—the third most represented nationality after American and Dominican. It’s estimated that 80 more Venezuelans will sign with teams this year. They leave behind family and friends in a country that is growing increasingly unstable. As the Venezuelan economic crisis has boiled over into violent and sometimes deadly protests of President Nicolás Maduro—who has failed to address the desperate food and medicine shortages and who is accused of altering the government and the constitution to shut down political opposition—many players have begun speaking out. Reportedly, some of the Venezuelan players have kept quiet out of concerned that their public support of the protests would put loved ones back in Venezuela at risk. But those that want to comment on the unrest have been using social media to share their messages of support for the protests and to raise awareness. 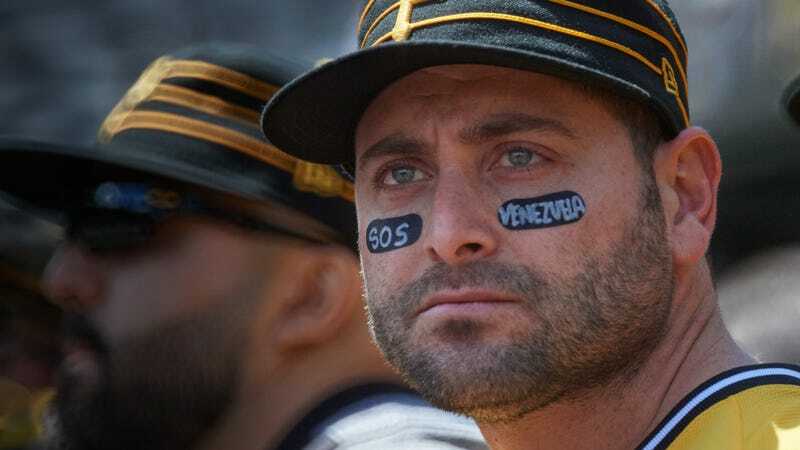 Although Cervelli, who insists his concern is not for politics but rather for human rights, rejects the notion that he’s a leader for his countrymen in the league, he helped organize a video featuring 13 Venezuelan ball players calling for an end to the repression and corruption of Maduro’s regime. Cervelli’s Instagram has become almost entirely messages of support, civil disobedience, and reposted videos depicting the violence protestors are facing. He and teammate Felipe Rivero have started taking a Venezuelan flag with them on road trips and posting photos of themselves posing with other Venezuelan players, holding the flag upside down as a signal of distress. Miguel Cabrera and Alcides Escobar partnered with La Vida Baseball for a video that implored people to go beyond social media. “Sending messages right now do not mean anything because they’re fighting, fighting for food, fighting for a better life, fighting for everything, for medicine,” Cabrera says. Many players are sending supplies home to their families. Major League Baseball released a statement saying that because of the “extremely dangerous and volatile” situation in Venezuela, it will be holding showcases for Venezuelan players outside the country and urging personnel who do enter the country to follow specific safety guidelines.